Twitter has been experimenting with extended character limits for Tweets since September. Just in case you don’t know, until now the limit for Tweets was 140 characters. In September Twitter allowed a modest sample of users to spill over and make posts as long as 280 characters. It has now decided to roll out the change worldwide, to “all languages where cramming was an issue*”. Key to the full rollout of these extended Tweets was a study of the effects of the limited rollout since September. Twitter says it wants to preserve the brevity of messages posted on its social platform since inception. The brief and pithy messages posted on Twitter are behind its unique attraction among social networks. In the trials since September the company found that many test subjects Tweeted up to the 280 character limit “because it was new and novel” but behaviour soon normalised. In another sign of success, the facility to be able to Tweet longer messages when necessary made the test subjects Tweet “more easily and more often”. 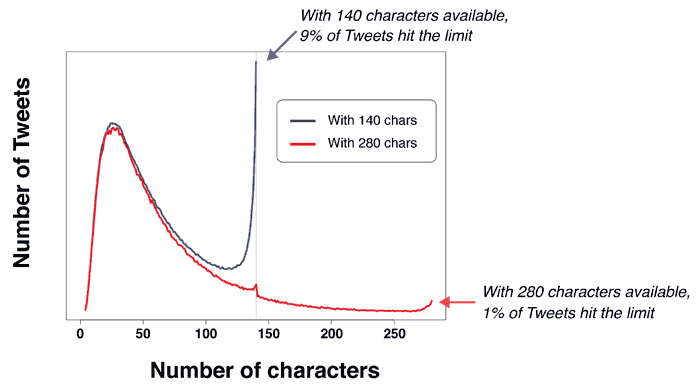 Providing some background detail, Twitter says that “historically, 9 per cent of Tweets in English hit the character limit. This reflects the challenge of fitting a thought into a Tweet, often resulting in lots of time spent editing and even at times abandoning Tweets before sending.” The updated 280 character limit reduced that metric to 1 per cent. Furthermore, from the test that has now completed; only 5 per cent of Tweets sent were longer than 140 characters and only 2 per cent were over 190 characters. This means your Twitter timeline shouldn’t substantially change and you should see approx the same number of Tweets per page.